Exton, PA — LUMIFLON announced today that it is implementing a carefully designed social media strategy which will include a blog, and a presence on Twitter and LinkedIn. The purpose of LUMIFLON’s social media presence is to serve the company’s current and potential customer base by exploring industry innovations, new technologies and the introduction of new product applications in a real-time, engaging manner. 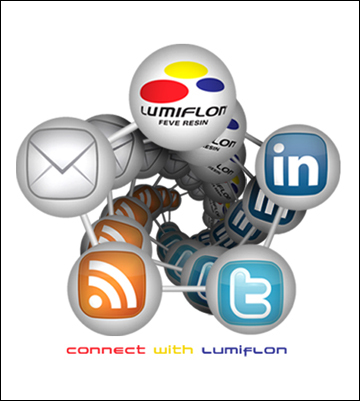 Winn Darden, Business Manager, stresses the importance of social media tools as an essential element in LUMIFLON’s overall marketing strategy, saying, “Our entrance into the social media realm will enable us to better serve our customers and the industry as a whole”. Darden went on to explain “As part of the macro-strategy each online tool will have its own individual purpose, yet work in harmony with one another. Furthermore, consideration will be given to other new and emerging tools as they come online. We see this new form of communication as having immediate importance that will only increase over time”. LUMIFLON’s blog can be found at: www.lumiflonusa.com/blog. LUMIFLON’s Twitter and LinkedIn updates can be reached via LUMIFLON’s homepage: www.lumiflonusa.com. LUMIFLON, a product of Asahi Glass Company, is a solvent-soluble fluoropolymer that offers distinct advantages for architectural structures, aircraft and automobiles worldwide. For additional information or to contact us, visit www.lumiflonusa.com/contact.